The hotel in Cincinnati is the Kirkwood Inn. The deal is $74.95 per night which includes breakfast. To reserve a room call 1-800-732-4741 and mention the MINI group. They have up to 35 rooms available. Stay tuned for more info as it becomes available.. 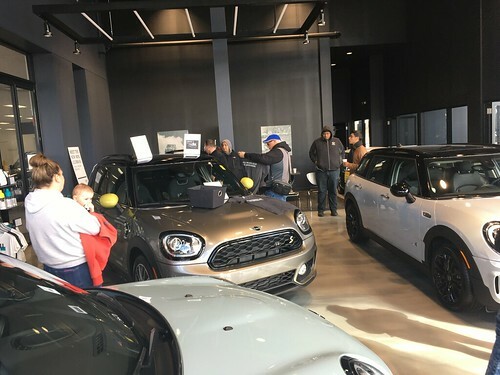 Here are additional links to info at MINI2 and at North American Motoring as well as in the MINIUSA Owners lounge. We had over 30 cars brave the slightly chilly early spring tempratures and headed out for the drive. After a bit of a slow start, we got on to some fun back country roads, and re-visited Snake Road, and the “roller coaster” (Alden) road. Millie's did a great job accomodating our larger and later than expected crowd. We even spied a “skunk works” group of Scions doing product testing on Snake road (I could have sworn I heard a supercharger wail comming out of an xB). I hope everyone had as good a time as I did. Thanks to the people at Patrick MINI for doing the filming. If anyone has photos or albums from the ride, send them along to me, and I will see if I can post a few. Club Membership Cards are out!! After a HUGE delay in delivering Club Membership cards, we are finally back on track. All the outstanding membership packets are hitting the post office tonight, and you should be getting them later this week. I want to thank all who have had to put up with way too long a wait. You have been very patient with us, and we appreciate it. We have extended the membership renewal dates for those who have had to wait. Here are a few group driving tips. If anyone has additional tips, feel free to post them below!! Headlights on: With the MINI’s distinctive headlights, it is easier for other cars in the group to see you when your headlights are on, even in the daytime. There may be times when we ask to have just the last person in line have their headlights on to make it easier for the leader to see the whole group. Others can keep running lights on for visibility. FRS Radios: We always have radios for the first and last cars in the group to help navigate through traffic lights and to try to keep everyone together. Bring along a radio to either listen in on the directions and progress, or help out as we get spread out on the drive. Our usual MINI channel is Main Channel 1, Sub Channel 1 (usually the setting out of the box. Drive in formation: Our group drives are not races.. There is no prize for first place. Staying mostly in formation adds to the enjoyment of the drive and looks really cool to onlooking cars and pedestrians, rather than terrorizing traffic by dodging and weaving across multiple traffic lanes. Doubling up at stoplights can help get everyone through the quicker lights as long as everyone ducks back together when it is safe to do so. Watch the car behind you: If everyone makes sure the car behind you makes the turn you just made, no one will get lost.. This can get difficult with heavy traffic and multiple stop lights, but if you notice the gap behind you getting larger, ease up a little bit, and hopefully the car ahead of you will do the same. This does not mean you need to come to a complete stop when someone behind you gets stuck at a light, just try to make sure the guy behind sees when you are making the next turn. If enough people have radios, we have a good idea when we are getting too spread out, and will wait up at an appropriate spot. Drive your own ride: This is perhaps the most important tip. Don’t allow the group to override your best judgement. If the pace is too fast for your comfort, slow down. It is better to wave other people around you if you feel you are holding people up than to push yourself beyond your comfort zone. Allow extra space in the twisty bits: Give a bit more room as we go ducking into the twistier sections of the drives. This gives you a chance to have a bit more fun through the turns, and allows for a safety margin for unexpected suprises. Faster guys in the back: The back of the pack is actually best for the faster people. Due to stoplights, traffic, and the Yo-Yo effect of starting and stopping, the people in the tail end tend to run a bit higher speeds than the front. Rules of the Road: Driving in a group does not suspend you from following the rules of the road. Speed limits, stop signs, red/yellow lights are YOUR responsibility. Some other drivers may wave us on at stop signs, or move over to allow us to continue as a group, but we do not get special rights as a MINI group.